Extend your Ubidots powered IoT App using Device Properties to fit business or Application logic. Having 100s or thousands of devices in Ubidots can seem like mountains of data that would bury anyone. But, with Ubidots Device Properties, you can quickly add metadata to your Ubidots devices to efficiently organize, recall, and work with data coming from 100s different data-sources. 1. What are device Properties? 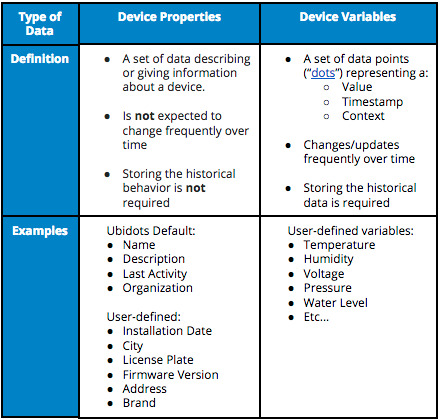 By definition, device Properties are metadata, or “a set of data that describes and gives information about other data.” In Ubidots, a device’s Properties are the metadata describing a device or its setting. Properties are not variables. A device's Variable is the specific sensor or digital data providing insights to a system or a process and are updated regularly. A device's Properties are the specific identifying or describing attributes of a device, its location, or its characteristics. Properties tend to not change nor are device properties stored as a form of data. Ubidots Device Properties allow you to add a layer of custom metadata to your devices for efficient device identification, organization, and usability. To add a new property to a device, simply click on your device then scroll until you see the “Properties” title in the left-hand device options pane. At the bottom of the pane, you will find "Add new property." List: A list of text strings, which will be presented as individual values in a drop down menu. You may want to check out Ubidots Device Types to specify a default set of Properties for any new device that is on-boarded to Ubidots. Do you need any help configuring your device types? Feel free to reach out to us using the in-app chat or by writing to support@ubidots.com.